The Kano was the largest school of painting in Japanese history. It dominated Japanese painting for 400 years, from the Muromachi era to the Edo era. In the Hara Rokuro Collection is a series of hanging scroll paintings by Kano school artists collectively referred to as Paintings used for wallpaper and fusuma (Japanese sliding door) at Nikko-in Mi’idera Temple. These works were originally partition paintings (shohekiga) that decorated the Nikko-in guest hall at Mi’idera (Onjoji) Temple in Shiga prefecture, the site of the Mii no Bansho (evening bell at Mi’idera Temple), one of the famed Eight Views of Omi (Omi Hakkei). We hope you will enjoy Landscape with horses by Eitoku Kano and other selected partition paintings by the Kano school in which the beauty and expressive power of ink are on full display. Hara Rokuro acquired the Nikko-in guest hall and moved it to his estate in Gotenyama (present-day Kitashinagawa in Shinagawa ward, Tokyo) in 1892. The partition paintings in the guest hall were converted to hanging scrolls and folding screens at that time. Early in the Showa era this building was donated and relocated to Gokokuji temple (in Bunkyo ward, Tokyo) where its name was changed to Gekko-den. This building has now been designated an Important Cultural Property. 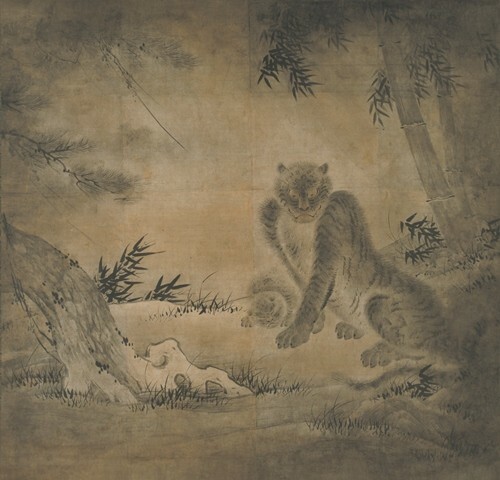 The tiger was often depicted in Japanese art as an auspicious symbol for wealth, status and fecundity. Representations of tigers were placed at entrances to impress visitors. Eitoku Kano (1543-90), believed to be the painter of this image, established the gorgeous, monumental style of Momoyama-period painting. Few of his paintings have survived the flames of war, making this one all the more precious. The dragon, one of the Eight Legions (guardians of the Buddhist teachings), was thought to have the power to make clouds appear and rain to fall. 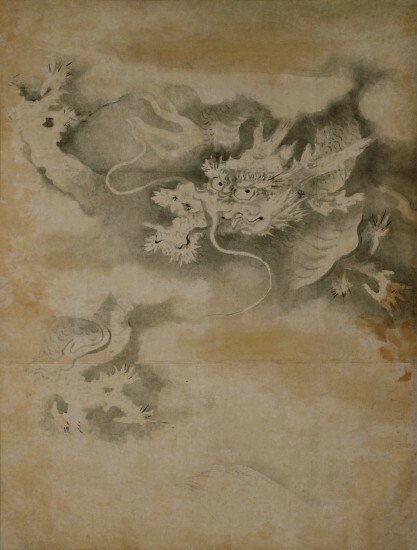 For this reason, many paintings were made featuring the dragon-among-clouds motif. The portrayal of the landscape is noted for its conspicuous use of empty space and painterly touches. With respect to its unique brushwork and composition, one can see many characteristics that are shared with Landscape with horses. 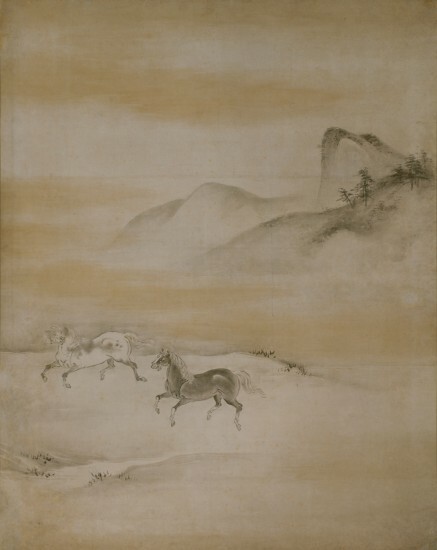 This is one of two masterpieces in the Hara Rokuro Collection that takes as their subject wild horses running through a field (each consisting of four scrolls). Here, the forms are captured using delicate lines and light sumi ink gradations. Though the ink is light in tone, the horses, each with a different coat of fur, are depicted with a sense of great dynamism. Closed: Thursdays (except March 29 and May 3) *Subject to temporary closure in the event of severe weather.